HÀ NỘI – ASEAN ministers praised the support of Japan, China and South Korea in strengthening ASEAN + 3 co-operation in food, agriculture and forestry fields at the 18th meeting of ASEAN Ministers of Agriculture and Forestry – AMAF + 3 (China, Japan, South Korea), held in Hà Nội yesterday. “For the last few years, the countries in the region have made big changes in agriculture and forestry production, which originated from changes in household incomes, consumption habits and distribution networks affected by urbanisation and industrialisation”, said Vietnamese Minister Nguyễn Xuân Cường. “This brought both opportunities and challenges to ASEAN and its three partners to ensure food security and safety as well as narrow the development gaps, and build up sustainable agriculture”, Cường told ministers. The ministers appraised the implementation of the ASEAN Plus Three Co-operation Strategy on Food, Agriculture and Forestry (APTCS) for the period of 2016-2025. They said the APTCS expressed a close co-operation within the framework of ASEAN Plus Three and focused on activities on food security, sustainable management of forests, adaptation to climate changes, health of animals and plants and epidemic control, human resource fostering, enhancement of information and cyber knowledge exchange, improvement of productivity, quality and market access of agricultural products and strengthening research and development (R&D). The ministers also highly appreciated the progress of the ASEAN Plus Three Emergency Rice Reserve Agreement (APTERR) and reaffirmed their plans to continue supporting the agreement in the future. The ASEAN Food Security Information System (AFSIS) had made headway in the dissemination of food security information among the member states as well as improvement of statistics on agricultural product processing and distributing in ASEAN, the ministers said. In the meeting, the ministers signed three documents of amendment protocol of APTERR; a memorandum of understanding (MoU) between ASEAN and China on agriculture and food co-operation; and an MoU with the Food and Agriculture Organisation (FAO) on Agriculture and Forestry Co-operation Enhancement. The 6th ASEAN-China on SPF (Sanitary and Phytosanitary) Ministerial Meeting took place on the same day in the city. The conference was held at a time of great significance for ASEAN-China co-operation, marking 15 years of strategic partnership, 27 years of dialogue partnerships and 21 years of dialogue at the summit level. “For the past three decades, the partnership has expanded to include areas where food safety and animal and plant quarantine play an important role in many activities”, Cường said. “ASEAN-China co-operation has been underway to facilitate the flow of goods and trade in agricultural products between the two parties”, he added. This year’s meeting was an opportunity for the two sides to review the results of their co-operation and exchanges on sanitary and phytosanitary issues over the past two years and adopt the action plan for the next two years, as well as prepare for the development of the ASEAN-China MoU on SPF co-operation for a new period so as to effectively support the implementation of the ASEAN-China Free Trade Agreement. By 2017, ASEAN-China two-way trade turnover hit a record US$515 billion, including an important share of trade in agricultural products and foodstuffs. Since the ASEAN-China Free Trade Area was formed in 2010, ASEAN-China trade has consistently enjoyed impressive growth of nearly 20 per cent annually. China is now ASEAN’s largest trading partner and ASEAN is China’s third largest trading partner. On Thursday, in the 40th AMAF meeting, agriculture and forestry ministers adopted a multi-sectoral framework for climate change: agro-forestry towards food security, nutrition and the implementation of sustainable development goals (SDGs) through sustainable use and efficient land, forest, water and fisheries resources. The meeting adopted five important guidelines to ensure the safety and quality of agricultural products and to facilitate agro-forestry trade within ASEAN. 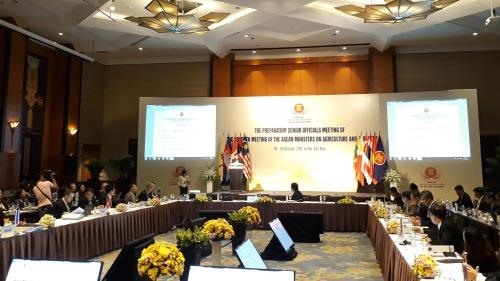 The ASEAN guidelines on promoting responsible investment in food, agriculture and forestry to increase investment in these areas in the ASEAN region as well as sustainable use of natural resources were approved at the meeting. The AMAF approach to gender mainstreaming in the food, agriculture and forestry sectors aims to support ASEAN member states to promote and support gender equality in agriculture and food policies, programmes and systems at regional and national levels. The ministers endorsed the ASEAN roadmap to strengthen the role of agricultural cooperatives in the global agricultural value chain in the period of 2018-2025. This is a framework for harmonising the legal and institutional structure of the agricultural co-operatives of the ASEAN member countries. The ministers also approved some documents enhancing forestry and fishery production.